It may have been a grey Saturday in May however, this did not stop intrepid Natalie Lambert of our General Healthcare Team from completing a life-long ambition; a Charity Sky Dive! Natalie decided that she would like to raise money for Parkinson’s UK as her Grandfather had recently been diagnosed with the disease. Compass celebrate end of year in style! On Friday 8th April we held our Quarterly Employee Recognition event coinciding with the end of the financial year at the Royal Maritime Club in Portsmouth. 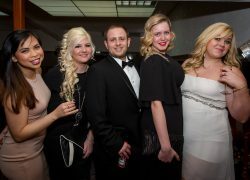 Employees were treated to a 3 course meal and entertainment including a magician, casino tables and a photobooth.